Search engine optimization (SEO) is the practice of getting web pages to rank at the top of the search engines. 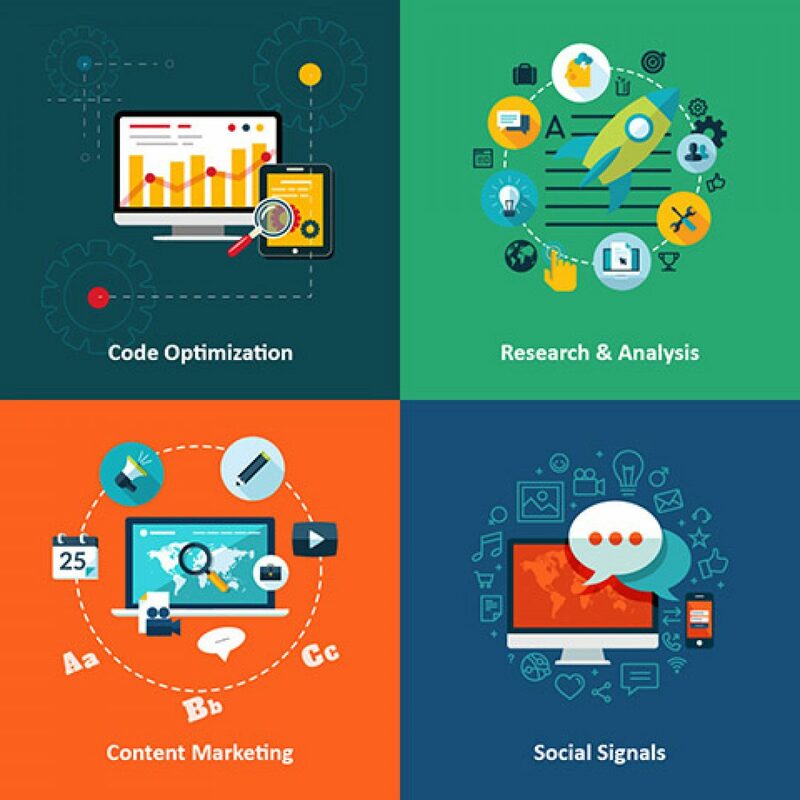 It involves optimizing the website’s code and written content as well as getting other websites to mention your brand and link to your website through proactive outbound marketing. Search Engine Optimization (SEO) is often considered as the “Holy Grail” of Online Marketing, as securing top ranking in search engine for your chosen keywords, will often result in a swarm of laser-targeted visitors, leads and sales. SEO is a long-term strategy which takes months of consistent efforts to gain relevancy, reputation and authority to a website. Since most users click on the first results (and less than 1% of users ever reach the second page), the competition for the top 3 spots is the most significant, and sometimes makes the difference between 5 visitors a week to 2,000 visitors a week. In order to rank higher on search engines, your website needs to have high ‘Authority’. This elusive trait can be achieved with a super-fast loading time, clean and efficient code, great web design and user engagement, as well as off-site recognition; such as social mentions, likes, shares, re-posts and links. Having other websites mention your website and linking to your website is an important factor, as it shows that others as well think your website is relevant, useful and worth talking about. This plays a crucial role in how others see you website, which increases your website authority. Our Search Engine Optimization Experts are ready to work with you to optimize your website, get more organic traffic, increase leads and sales and improve your business. Keyword Research: Analyzing competitors’ websites and keyword phrases users are searching for, estimating search volume and finding specific keywords to target. Website Architecture: Creating an effective site structure and content hierarchy. Implementing effective navigation bars, allowing users to easily reach all pages. Content Optimization: Rewriting and updating content as needed. Seemlessly embedding target keyword phrases to the content and META tags. Page Loading Time: Implementing tweaks and fixes to website code and hosting server. Enforcing canonization, caching and compression for faster loading time. User Engagement: Monitoring user engagement with the website. Using Analytics Goals to improve success, bounce rate, time spent and overall visitor satisfaction. New Content & Media: Creating and adding new content pages, articles, blog posts, images, videos and other media as necessary. Social Signals: Anouncing new content and updating popular social media channels such as Facebook, Twitter, Google+, Youtube and leading blog platforms. Inbound Marketing: Securing incoming traffic and links using content distribution, press releases, directory listings and outreach to relevant authority websites. At Momentum Plus, we help companies around the world achieve their business goals through expert online marketing services. We provide high standard, reliable services using best practices and proven strategies. We harness over a decade of hands-on experience in search engine marketing, Pay Per Click advertising, web design and much more. Whether your goals are traffic, leads or revenue – we have the right solution for you. We think differently for every client, learning and understanding their market, their needs and their goals, brainstorming, strategizing and executing profitable campaigns. What sets us apart from other companies, is how much we love what we do, and our attention to details in every single campaign, landing page or ad copy – down to the tiniest task. We take our work very seriously, yet “spice it up” with creativity, originality and a touch of insight. We are proud of our personal and dedicated customer care and strive to deliver the best customer experience possible. We are a fast-growing, creative and dynamic company, providing results-oriented, Google qualified solutions. Need an experienced team to optimize your website for search engine ranking?